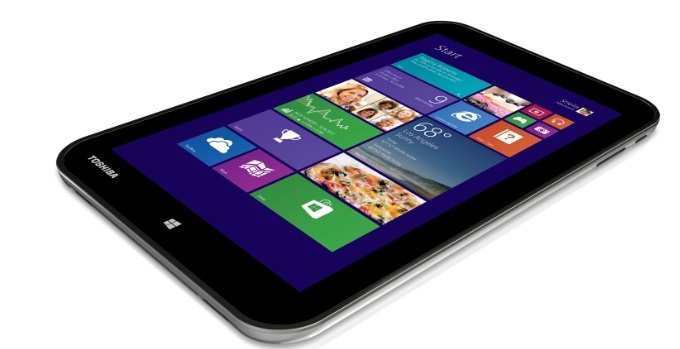 There are plenty of new tablets at IFA and among them is this newbie from Toshiba. The Encore tablet runs Windows 8.1and sports a you, guessed it, eight inch screen and Tosh says it is designed for consumers who want a tablet that they can both work and play on. It features a full version of Microsoft Office Home & Student 2013 inside and comes with seven GB of free online SkyDrive storage which means files can be stored in the cloud for fast access and synchronisation with other Windows devices. There’s also an optional Bluetooth® keyboard. It comes with lots of entertainment style apps on board too including, not surprisingly,the Microsoft Xbox app which also includes free music streaming for 90 days unlimited with access to 30 million songs as well as a selection of free Xbox games. The tablet is also optimised for Skype and sports advanced camera features and dual beam-forming microphones with noise reduction which Tosh claims gives greater sound clarity during calls. Other features include an 8.0MP rear camera and 2.0MP front camera,micro-USB for transferring data, micro-HDMI® for connection to larger screens and a microSD slot can also be used to expand storage or share content with other devices. It goes on sale in Q4.